Paper-Roses will be two years old next month. To be honest, I can’t quite believe how quickly it’s gone or how much I’ve learnt in such a short time! I started out on this journey as a complete newbie. I had a renewed love of drawing and painting, a passion for all things paper and a wish to create something beautiful in an eco-friendly way…but I didn’t really have a clue how to make it happen. So, I started researching. Paper, printing techniques, printers and manufacturers - how to do what I wanted while still being as kind to the planet as possible. I’ve learnt an awful lot from the internet and even more from the people and experts I’ve met along the way. The learning curve has been steep (and it’s continuous! ), but it has been fun (at least most of the time 😄). And I’ll admit, I was immensely chuffed when I was complimented for my knowledge at a meeting with my printer. In fact, it was this comment that helped me to decide that I might be ready for the next step in my adventure - introducing a range of fabric products (something that I’d been considering because so many people were asking me if I could do reusable fabric gift wrap). Now, I’m going to say that finding fabric printers and manufacturers to work with was much harder than for paper. I want to work with local companies wherever possible and, of course, they have to have some eco cred. Luckily, I managed to find one Hong Kong-based company that works only with organic fabrics and has digital printing facilities. But, it turned out that while they have digital printing capabilities, they had only used them to print on jersey before, and while they had made items similar to those I was proposing before, my requirements were somewhat outside their normal remit. Despite these challenges, the company was happy to give it a go. It’s been a long and sometimes challenging process…but the fruits of these labours have now come to bear and a selection of fabric items are available in the Paper-Roses shop. Fabulous reusable fabric gift wrap bags. Available in two sizes and five fantastic prints, each bag comes with an organic cotton ribbon tie so they’re ideal for easy, elegant wrapping without scissors, tape or waste. Super, strong foldaway totes. Available in six beautiful, double-sided designs, each tote has an attached strap that allows you to fold it neatly away when not in use - a canny addition to any handbag. 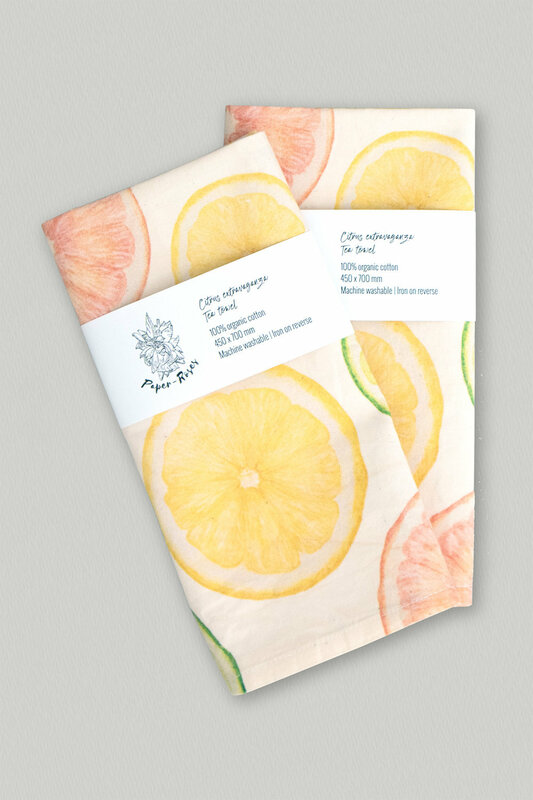 Oh so practical tea towels. Available in four fabulous designs, they’re perfect for drying all your dishes…and they’ll also double up brilliantly as super-sized napkins. It’s guaranteed that no chemical fertilisers or insecticides are used. Practices like crop rotation and intercropping are used to improve soil quality and health as well as insect biodiversity. It relies on natural (and sustainable) irrigation techniques wherever possible. But, it’s also an incredibly practical choice. It’s very strong, while still being lightweight, it’s naturally absorbent, and it’s machine washable. And just like all of my paper products, it’s biodegradable and recyclable too! I hope you love the results of Paper-Roses’ latest adventures. I’d love to hear what you think - comment below, or tag me at @paperrosesdesigns on Instagram.